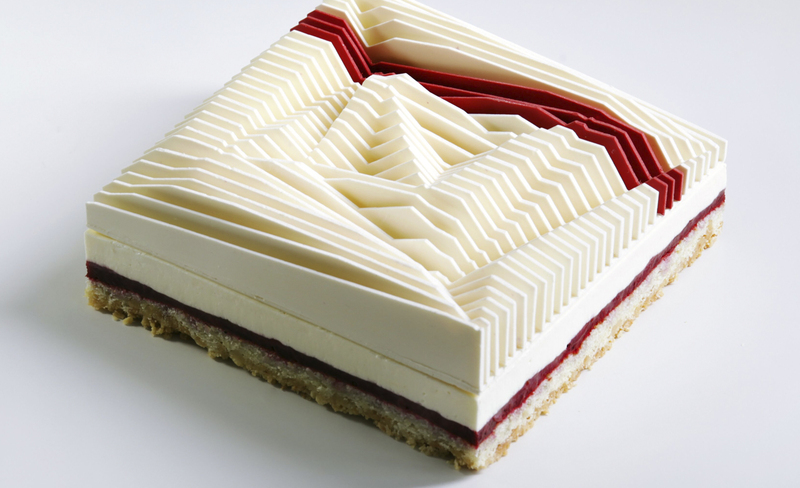 As reported in Design Boom, on a whim, Indiewalls artist José Margulis sent an Instagram message to Dinara Kasko, a Ukrainian pastry chef who uses modern computer modeling and 3D printing to create one of a kind, geometric cakes. Living and working on different continents didn’t keep them from becoming fast friends and quickly led them to cook up an exciting edible art partnership. 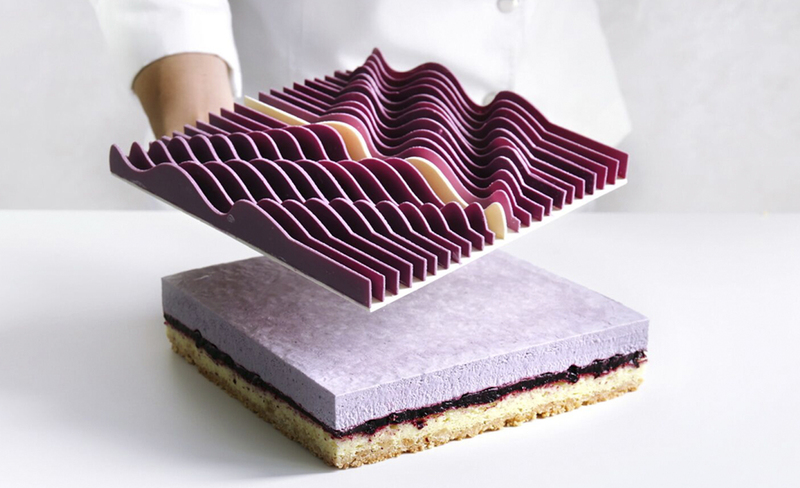 Recently, we caught up with José to learn more about how these breathtaking cakes were made and how this collaboration relates to his larger artist practice. Indiewalls: Let’s just start off by saying that these cakes are amazing. We’ve never seen anything edible quite like them—including within your portfolio. What are they made of? José: Everything is edible. The tops of the cakes, which I helped to create, are CNC cut (a machine cutting technique) from chocolate and gently placed on top of the base of the tarts. 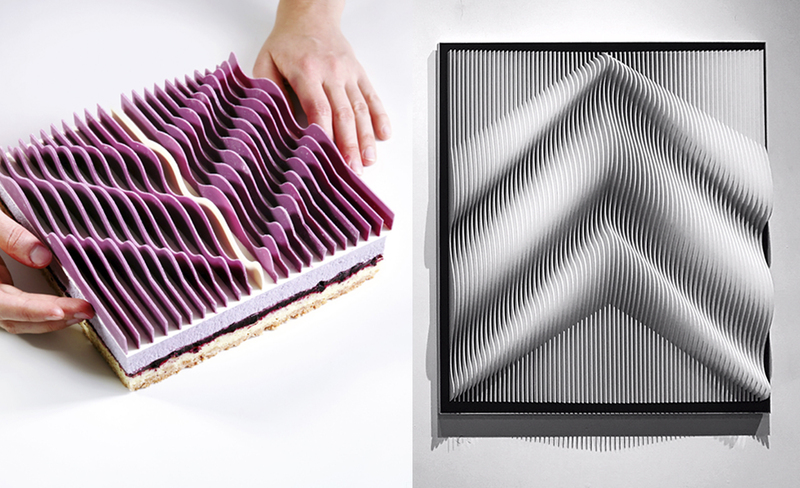 Many of Dinara’s other pastries are formed with 3D printed moulds. Streusel, almond sponge cake, cherry confit, yogurt mousse tart. I: What was your process for collaborating with Dinara? J: These pieces are smaller adaptations of two current existing pieces, with the scale appropriately adapted for sheets of chocolate. I worked directly with Dinara to determine the limitations of the cake and the chocolate and was able to adapt a few designs from previous works to fit the required scale. A big challenge with this scale was determining the correct pitch, meaning the density and separation of the fins to prevent any loss of resolution at the proper viewing distance. Once this was worked out, I emailed Dinara an individual cut file for each chocolate layer and a blueprint for how the full pieces should be hand-assembled. I: What was the most exciting part of your collaboration? J: When I reached out to Dinara, there were never any commercial discussions of any kind. The process was organic. Our partnership came from the pure bliss of two unfamiliar artists making something exciting and beautiful together. I told her, “I love your work, and I feel we have a lot in common. Please check out my feed and let me know if we could try to do something together.” She replied almost immediately by saying that she was ready to do something with me right away. And, so it began. Streusel, almond sponge cake, confit blackberry-blueberry, mousse with blackberry and mascarpone tart. I: What is your main body of work like? Is it similar to the cakes? J: My sculptures are aesthetically similar but use a different set of materials. I digitally design geometric, 3D objects and then divide them into linear slices. 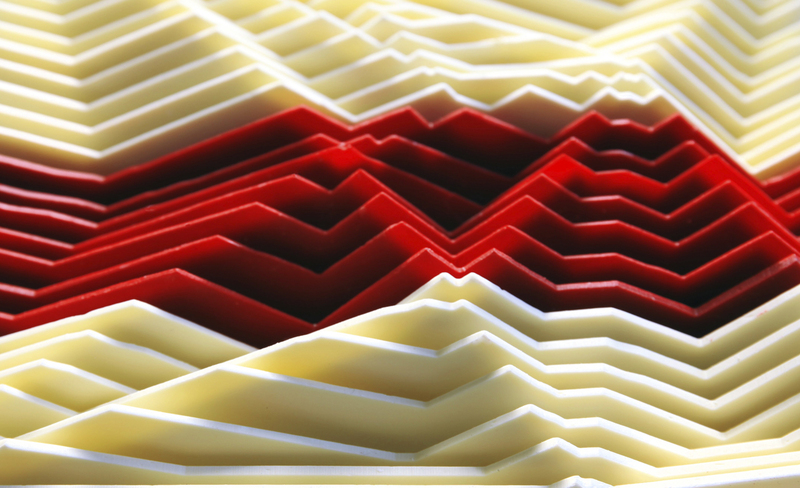 The slices are cut from different kinds of plastic materials and fixed to rigid canvases or pedestals. The plastics include a variety of translucencies, colors, patterns, textures, or photos printed on them. I think of my tri-dimensional pieces as blueprints that are activated by applying or pouring light through them. In a sense, light becomes the ink that reveals my designs by flowing through my 3D templates. The pieces look very different based on vantage point and light exposure. A side by side comparison of a single blueprint reworked for cake and for wall sculpture. 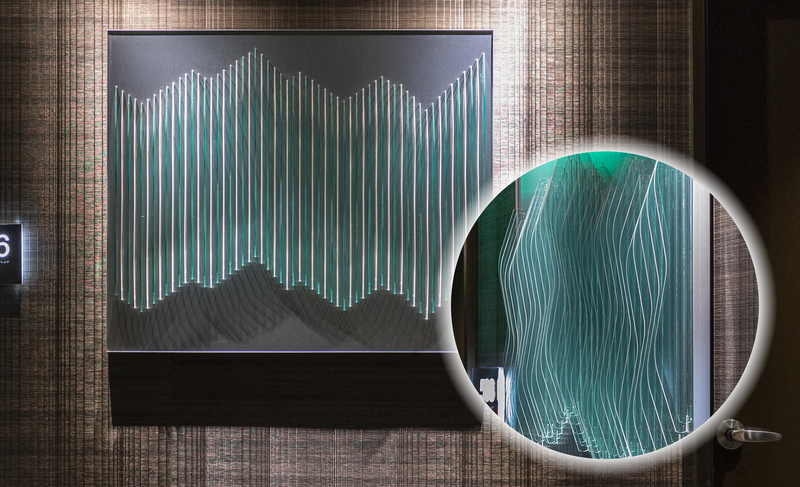 The piece at right was developed for the Celebrity Edge Cruise line, for which José developed 4 acrylic works that references the undulating sea. I: You’ve worked on quite a number of Indiewalls projects. Do you have a favorite? First, the Dream Hotel, Hollywood because many of the floors have a custom piece of mine in the elevator lobby, so the property feels like a very special gallery display. My other favorite is the Celebrity Edge Cruiseship project we recently worked on because I was able to create a connection between two different non-representational, geometric pieces and the sea. One of the pieces that I made for the cruise ship is actually a scaled-up version of the artwork atop the purple cake, which comes from my “racer” series. This piece has a strong visual link to wave movement and is very relevant to the cruise ship. José created 7 custom pieces for the Dream Hotel, Hollywood, ranging from 24” - 42” in either dimension. Each piece appears different depending on where it’s viewed from and how the light hits it. See more of José’s work on Indiewalls, and follow us to find more inspirational updates like these on Instagram. Want to stay on top of our link round-ups and other great art, design, tech news? Join our mailing list.